Exactly eight years ago I became a certified indoor cycling instructor, which has changed my life enormously. I went from being a back-of-the-class shy girl to a front-and-center leader making amazing friends and helping people get healthy, which is a total privilege. (Sometimes my classes are the best part of my day!) But, like any profession, being an indoor cycling instructor has its drawbacks. 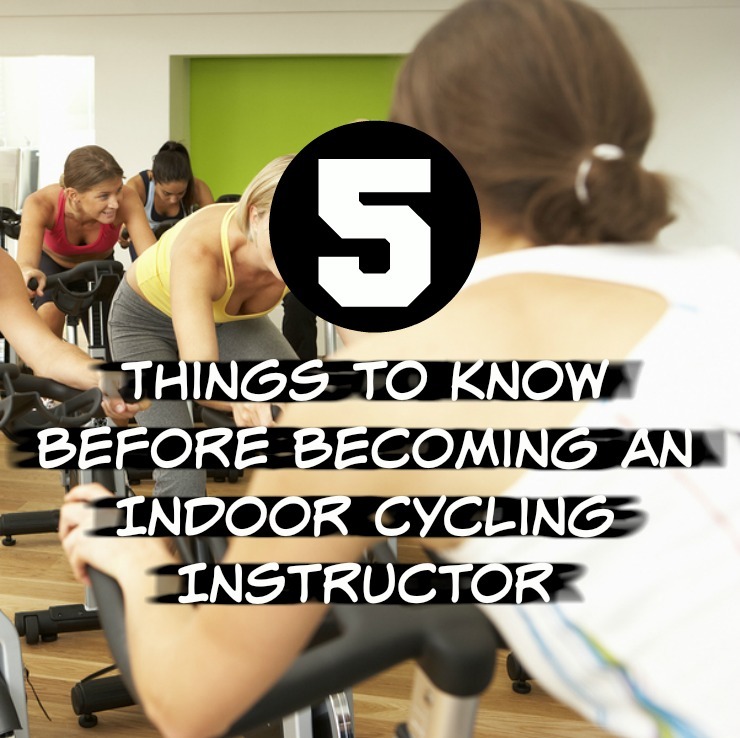 So, if you think you might want to become an indoor cycling instructor, too, get your cycling shoes clipped in and your Spotify playlist ready, and read on for the five things you should know before you take the plunge! 1. Your certification is important but can work against you. There are several companies and organizations that have a Spin/indoor cycling certification, including Mad Dogg, Schwinn and the Aerobics and Fitness Association of America (AFAA) that can cost hundreds of dollars and, depending on where you live and what kind of gym/studio you are applying to, they are not all looked upon as equally desirable. You will want to scope out the local scene to see what gyms in your area are looking for before you commit to a program. Also, all of them require follow-up classes for continuing education, so that is even more time and money you will have to lay out in the future. 4. People are very interesting. Most folks you will meet in class will be wonderful. By nature they will be friendly, outgoing and upbeat. However, on occasion you are going to have to deal with difficult personalities, such as control freaks who want to micromanage how you do your job or people who “hog” the fan in the room for themselves (true problem I had to manage between adults this past weekend). The thing is, you are going to be in charge for the hour, so you need to learn how to deal with many types of people and make sure they all get what they need for a successful class. Banish any illusions of putting on groovy music and just tuning out the world for an hour — this is work! 5. Hammies so tight you could play drums with them. Cycling is a repetitive exercise where you are mostly in a seated position, so you will need to learn how to lengthen tight hamstrings. When those puppies are not being dealt with properly it can lead to back and knee pain, which is no fun for anyone. Learn to keep ahead of any injuries by finding the time for preventive care every day. Stretch and foam roll like a fool to keep them in check! Great tips, Margo! I’m currently working on my Group Fitness Instructor certification with ACE…so insider info on things like this is super helpful! Great tips! I’m a group ex instructor and recently took the Keiser training. If an individual wants to teach at a gym, there’ll be a music player and head phones available. Some gyms require instructors use their brand of music (ex PowerMusic) or provide your own. Those are great- I would recommend speaking to studio owners & gyms before you get certified. I became certified in February but all the gyms had done their hiring prior to the New Year’s Rush, so I didn’t actually get my own class until September Ugh! Great article. I wanted to get more into spinning, so looked into the Peloton. It was too expensive, but found this article that shows how to make your own Peloton on a budget. Spotify is also a great music resource where instructors pay a monthly rate for unlimited music. Speaking of music, plan on spending a LOT of time (especially when you first start) creating playlists and ride profiles for your classes. Get to know some helpful indoor cycling blogs and websites where other instructors share their ideas!